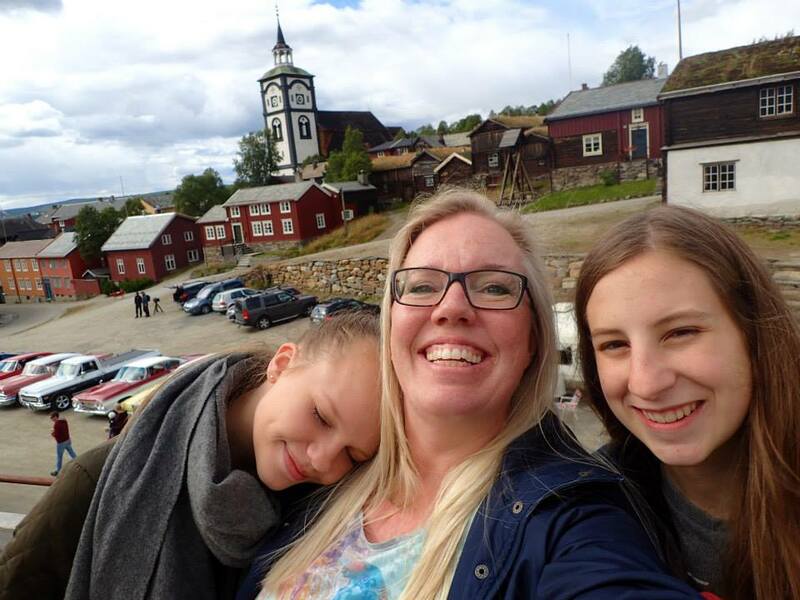 Senior and former “Nite Crier” writer and editor, Emily Wolf, is currently residing in Norway and will spend several months there. I was very curious about her experiences in Norway so far and what initially led her there. Read my interview with Emily below to find out about the city she lives in, what life abroad is like, and how her plans to travel began. Emily has a blog of her own that she updates with posts about her time in Norway, so if you would like to hear more about her story check http://wolfofwisconsin.weebly.com/ regularly! Kylie: When did you decide you wanted to travel abroad and what program are you involved in that gave you the opportunity to do this? Emily: I think I didn't so much decide I wanted to travel abroad as much as I was just curious about the idea. Last year, I got a letter from the Slinger-Allenton Rotary Club saying if I was interested in the idea, there was an informational meeting. I went and I really liked the idea, so I continued with the process, which led to interviews and the application. The Rotary International Exchange Program is a wonderful program that sends kids from all over the world to around 40 other countries. Besides that, they make sure outbound students (students preparing to go abroad) are well prepared for the challenges they will face. The local clubs are also very welcoming to inbound students (students on exchange), and to rebounds (students returning from exchange). The whole process is very well organized and very supportive. K: Why Norway? Did you choose your location or was it chosen for you? E: On the application, you are given a list of all the possible countries you can go to. Some get eliminated because you're ineligible-for me, it was because of language requirements or age restrictions. Of the remaining countries, I had to rank them. I did a lot of research about each country while I was ranking them. I ranked Norway as my number 1 choice simply because I thought it would be an amazing place to go. I was curious about their culture and history, because it's not something we learn much about in school. I was very fortunate to get my number one choice; not everyone does, but I think no matter where I would have gone, I would have an amazing experience. K: When did you leave and when will you return? E: I left August 9, 2015. The idea is to spend somewhere between 10 and 12 months in your host country. I have a rough return date set for June 14, but my school here doesn't finish until closer to the end of June, so I'm not really sure when I'll be back. K: What is the city you are staying in called? Is it near any major cities or landmarks? 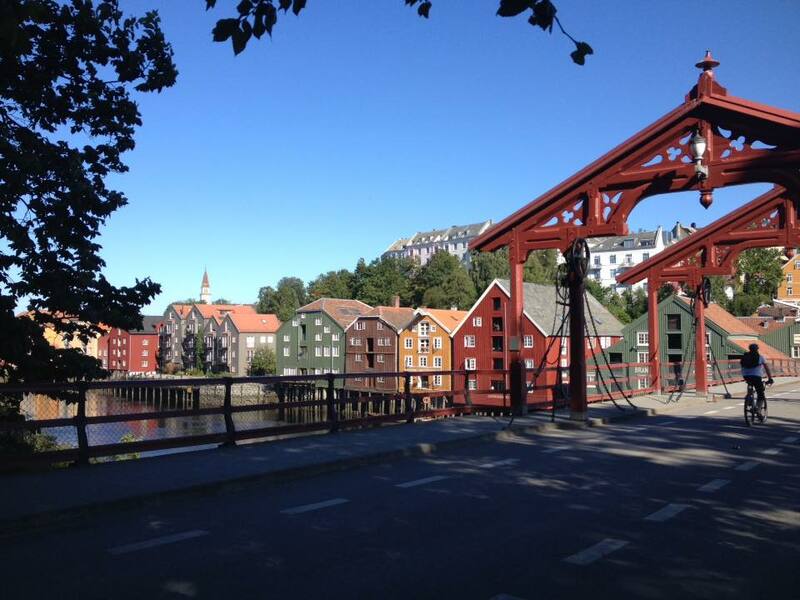 E: I'm staying in Trondheim. 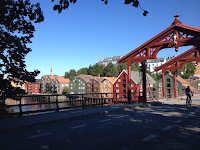 It's the third largest city in Norway, but it has a very comfortable feel to it. It's a very popular city for tourists. Some of the main attractions are the Nidaros Cathedral, the Old Town Bridge, the harbor, the city center and several interesting museums. Because the city is so old (over 1000 years!) there're a lot of historical buildings like military forts, monasteries, churches, etc. Even my school has a lot of history! It's the oldest school in Norway and boasts many famous alumni, including past kings! The area I live in, called Trøndelag, also has a lot of interesting history, mostly involving the Vikings because of its location along the western coast of Norway. K: What is your host family like? 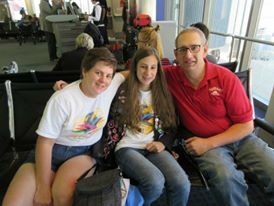 E: My host family is absolutely wonderful! My mom, Eli, is a dentist, and my dad, Sture, is a teacher. I also have two host sisters. Runa is 17 and on exchange in Holmen, Wisconsin. Ylva is 15 and lives in Norway. We all get along super well and they're super supportive of me. They've taken me to some pretty cool spots in the area and are always helping me with the language. My host mom was an exchange student when she was in high school, so she also understands what I'm going through with homesickness and language issues. K: What does your daily routine look like? E: I attend Tronheim Katadralskole. My school schedule actually changes from day to day. So on Monday, I have gym class as my first class at 10:00 am. So usually on Mondays I get up about 8 to finish up homework or just slowly get ready for school. After gym, I have lunch from 11:30-12:00, and then I have something similar to homeroom where we get updated about what's going on that week. At 12:30 I go to a school about 5 minutes away for my Psychology 2 class, and then, at 2:00, I go back to my school for International English until 3:45. Tuesdays, I have Chemistry starting at 8:15 and going until 9:45. Then I have math from 10:00 to 11:30. I get an hour for lunch, which I usually spend in the library study center. After lunch, I have Norwegian class until 2:00, and then Spanish from 2:10 to 3:40. I go home for about an hour, and then I return for an introductory language course that lasts from 5:00 to 6:45. Wednesday, I start at 8:15 with Psychology at the nearby school-called Thora Storm-, and then return to Katta (short for Katadralskole) for International English. Lunch lasts from 11:30 to 12:30, and then I have history class until 2:00. Thursday we have something called fagdag, which means Subject Day. That's 4 class periods (3 hours) of one subject. Each week is a different subject, one week I have math, the next, International English, then Psychology, and then Chemistry. Lunch is from 11:30 to 12:30, and then I have Norwegian class until 2:00. Friday, I have Spanish from 8:15 to 9:45, Math from 10:00 to 11:30, and then an hour for lunch. After lunch, I have Chemistry until 2:00. Usually during lunch, I either go to the study room or my friends and I go into the city center if they have any errands they need to do. The weekends are pretty relaxed. Often, Norwegian families go to their cabin (hytta) in the mountains for some weekends. My host family has taken me to their cabin twice. If we don't go there, we just relax at home. Friday afternoon, we go the grocery store and buy all kinds of candy and snacks. Then we stay up late Friday, usually watching TV. After my host parents go to bed, Ylva and I usually watch Modern Family or Gossip Girl. Saturday, we sleep in as late as we can, and have a lazy day. Usually in the afternoons, we go into the city center and shop, or meet with friends, or both. Saturday evening also has a lot of candy and TV. Sunday, Ylva and I work on homework and help my host parents clean the house a bit and get ready for school. K: What has been most challenging and most fun or rewarding about your travels? E: I think the most challenging part is dealing with the language. My goal is to come back fluent in Norwegian, but it takes a lot of work. When I first got here, it felt really strange to not be able to understand anyone, though they all could understand me. Now, I'm more used to the language, so I can block it out when I'm talking to people, and when they speak Norwegian to me, I can pick out some words I recognize. I'm able to say a few basic words and phrases that are really common. From reading for my classes, I've gotten pretty good at understanding written texts, though I usually have to use a translator for more difficult words. Still, I think it's a fun challenge. Another really fun thing is experiencing all the new things. I've tried a few new foods-mostly candy and desserts- but also meeting new people and seeing new things. For example, it's really common here to walk or bike to school, unless you live farther away from the city. And I've found that I really enjoy walking to and from school. It's only about 10 minutes, but there's a great view and it gives me time to think, relax, and exercise a bit. Also, almost everyone here has been to several other countries. Most people I talk to have been to the United States, but maybe not Wisconsin, so they can tell me about their visit, and I can tell them about where I lived. The goal of exchange is to experience and understand a new culture, and it's really fun to try the new things that they have to offer because you'll never know what it's like until you try. I took the liberty of describing some of the differences I've noticed because that's what a lot of people ask me about. The biggest difference, I think, is in the schools. In America, we have high school from grade 9 to grade 12. Here, they have barneskole (primary school) from grade 1 to grade 7, then they have ungdomsskole (youth school) from grade 8 to grade 10. 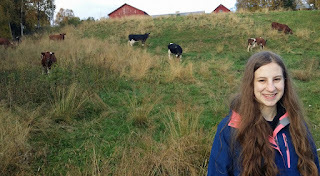 My host sister Ylva is in her last year of Ungdomsskole. This is as far as school is required for Norwegian children, but most choose to continue on to Videregående skole (upper secondary school) for grades 1 to 3. Since it's not technically required, the grades start over. Norwegians have one more year of school than Americans, so I'm with students my age here, but we're only in second grade, instead of third (the last year). Then, most students continue on to university. The schools here have a lot more freedom. There's longer passing periods, and you're responsible for being on time and getting your homework done. If you come to a class late, or leave early, the teachers don't do anything because they figure you're there by choice, and if you want to leave, you're only hurting yourself. When we have free time (during lunch, if a class lets out early) we can leave the school without signing out, and come back whenever. The teachers are also really good about using each student's strengths. For example, in my Norwegian class, I don't really do much because I don't understand the language, but in some of my other classes, my teachers ask me about what I had learned on the subject. In my International English class, my teacher asks me about what words I would use, or if I notice things about the way other people speak English. Now, we're writing essays, so she asks me how I am used to writing and formatting. Also, Norwegian children don't have a preschool. They go to a daycare until they start school in first grade. They also start learning English in first grade, so that they're fluent before they're even adults! Most Norwegian students go on to learn a third language as well. Norway has a really high standard of living, the second highest in the world, so most things are a little bit more expensive here. Also, because of the weather-usually cold and rainy-and the walking/biking most Norwegians do, they're always prepared with a rain coat and shoes. Even when they're dressed up, most Norwegians are wearing very practical footwear, usually sneakers or rain shoes. Norwegians are also less bold than Americans. On the bus, you never share a seat with a stranger unless there's absolutely no where else to sit, and then, you don't talk to them. When you walk past someone, most people look away from you. Norwegians become adults at 18, just like Americans, but for them, this also means getting their driver's license and also being able to drink. These are just some examples.